The SecurSwab Collection Kit for Crime Scenes from Bode Technology means more DNA can be collected from more Crime Scenes. Using the kit means reliable, secure and efficient crime scene sample collection. Each SecurSwab Collection Kit contains a Bode SecurSwab SIT Collector for highly effective sample collection. Kits use an outer envelope that is preprinted for properly documenting sample collection and crime scene information. The kit includes a Bode SecurSwab SIT Collector, a DNA Collector Transport Pouch, a sterile water vial, a dust mask, a pair of gloves and a pre-printed envelope for documentation and transport to the lab. Each kit contains a single collector, but there is room to document and store up to 5 samples. 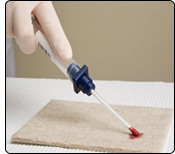 If extra samples are required, just use a SecurSwab from a crime scene toolbox. The kit’s components provide the user with the most secure and effective swab collection system available by using the Bode SecurSwab SIT Collector. The SecurSwab SIT Collector is uniquely designed to include an integrated desiccant which dries samples during transport and eliminates the need to air-dry most samples. The SecurSwab also includes 4 unique, matching barcode labels that can easily be applied to the collector packaging or documentation to ensure chain of custody control. The cotton tip is a proven collection material for many types of samples. Each collector is individually wrapped in foil to take up minimal space and protect the collector so that it is always ready for use. An independent study showed that collection using the Bode SecurSwab allows for more than 30% more DNA was collected using SecurSwabs compared to standard cotton swabs. SecurSwabs have also been validated for sample collection on surfaces commonly found at crime scenes including aluminum, paper, cotton, ceramic, concrete, wood, glass, metal, and cardboard. Bode’s safe, secure Buccal DNA Transport PouchTM with desiccant and customizable outer kit envelope are designed to protect and provide a stable environment for DNA samples during transport or storage. Buccal DNA Archival Trays minimize the amount of space needed to store Buccal DNA Collectors. A box containing 88 collectors is less than half of one cubic foot and can be stored at room temperature. Archival Cassettes are heavy-stock paper storage magazines designed specifically for the storage and archiving of the Buccal DNA Collector. 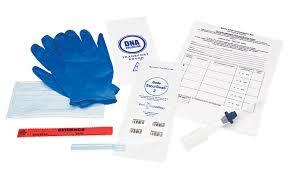 The kits contain all components required for documenting, collecting and transporting a DNA sample. These kits can include a Buccal DNA Collector, a Buccal DNA Transport Pouch with Desiccant, a Specimen Identification Card, an Instruction Sheet, Gloves, and Evidence tape. A. Cotton swab – Collect many types of samples. The sterilizing process renders the collector safe for use in buccal DNA collection or for assault examination. The collector can be used for forensic evidence and DNA sample collection. Prevents the shaft from breaking during collection, allowing a more rigorous collection. Sturdy polypropylene provides protection provides protection of swab and sample. desiccant is spent. The screw cap allows for easy exchange of a spent desiccant. Barcode numbers 128C symbology with 2 alpha and 8 numeric digits. Length of collector 8 inches; which converts into a 5.5 inch transportation tube after collection of evidence. Bode PunchPrep enhances the use of the Bode Buccal DNA Collector with direct amplification chemistries. 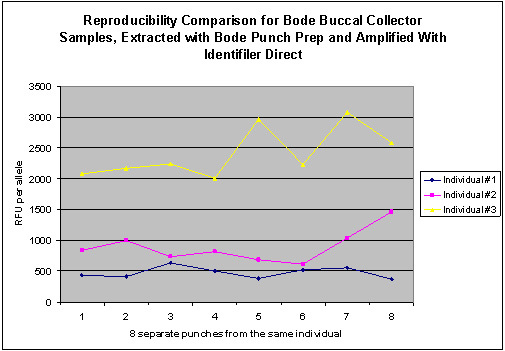 Bode’s validated protocols for processing the Buccal DNA collector with the AmpFlSTR® Identifiler® Direct PCR Amplification kit from Life Technologies and the PowerPlex® 16 HS System from Promega provide first pass success rates of greater than 80% – equivalent to the success rate processing samples on FTA paper. Bode PunchPrep has been developed so that Bode Buccal DNA Collectors can be processed with Direct-to-Ampflication chemistries, without significant changes to the protocol. Bode PunchPrep has been validated with Manual and Automated processes. Remove a 1.2mm punch from the Bode Buccal DNA Collector. Apply 2uL of Bode PunchPrep directly to the punch. Heat at 70C to dry the punch. Begin the PCR reaction as described in the Identifiler Direct/ PowerPlex 16 HS User Manuals. Bode analyzed the samples for accuracy of profiles as a part of the validation. The accuracy of the samples was 100%. Bode added known amounts of cells to the collector and processed using Bode PunchPrep and a direct-to-amplification chemistry. 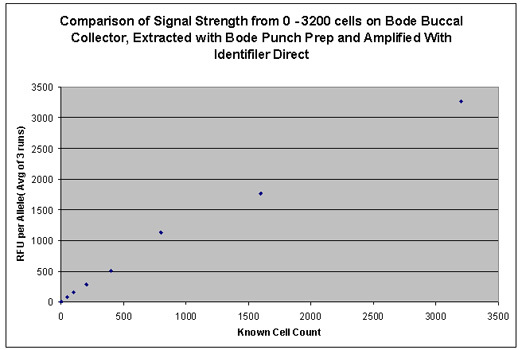 Bode used known cell counts of 50 cells, 100 cells, 200 cells, 400 cells, 800 cells, and 1600 cells. Below is a graph that shows the results of the Sensitivity Validation test. Bode processed 8 samples from the same collector to ensure the peak heights and balances are similar in each trial. Variability is anticipated due to natural gradients that occur during collection – as each sample is punched from a different area of the collector. Below is a graph that shows the results of the Reproducibility Validation test. The Bode Crime Scene Collector is designed to be a complete evidence collection system. This system uses Bode SecurSwabs that have been pre-labeled on the shaft and Protective Tube with barcodes to become Crime Scene Collectors. Ten Crime Scene Collectors are conveniently packaged with ten Transport Pouches in a resealable foil pouch for use at crime scenes. The Bode Crime Scene Collector helps law enforcement simply secure more reliable evidence for forensic analysis. The Crime Scene Collector comes labeled with pre-coded barcodes to reduce labeling time and ensure the collector and the protective tube are always matched. Each collector has its own unique barcode ID. The paper DNA Transport Pouch has ample room for labeling and barcoding to help improve control and tracking. Ten Crime Scene Collectors are package in re-sealable foil packs with ten DNA Transport Pouches. The re-sealable packs maintain the integrity of the collectors during transport and storage to and from the crime scene. The pre-labeled collectors save labeling and documentation time at the crime scene and minimizes mislabeling. The integrated desiccant eliminates the need to air-dry most samples. The Bode Crime Scene Collector offers the feature of semi-automated processing once the samples are received by the lab by eliminating the need to cut the cotton swab with scissors for sample processing. This saves time and prevents contamination during sample processing.